A rampaging bull has injured at least 11 people, one of them seriously, after breaking loose from a festival in the Spanish town of Talavera de la Reina. Its mad dash for freedom was halted by police officials. Ruptly video shows the wild animal hitting a person in a wheelchair, with frightened passers-by trying to escape. A 30-year-old man was gored and had to undergo surgery, reported Spanish media. He is now recovering in hospital. Also a nine-year-old boy received facial injuries, while the rest of the wounded received bruises. 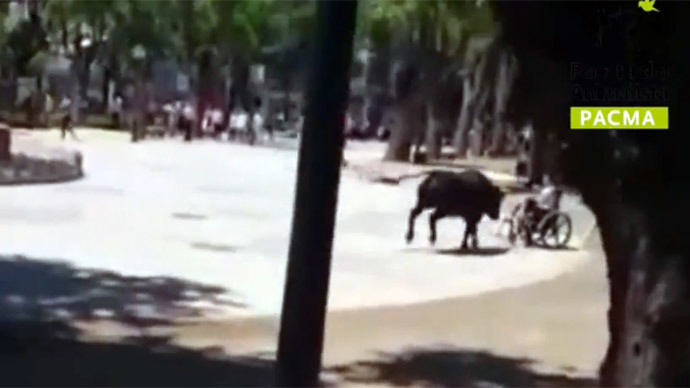 The bull managed to escape on Friday while it was being transported in the town, before it was scheduled to take part in a bullfight during celebrations in honor of San Isidro. But despite the animal’s crazy rush for freedom, it didn’t stand a chance. Police killed it by running it over. Law enforcers have opened an investigation into the case.